If you need brains! Fresh brains! Amy Grimehouse might just have the thing for you. Amy Grimehouse a cinema slash club night for lovers of trash, vile & cult film and television are renowned for their regular east London experiential and interactive cult movie nights featuring screenings, live performance and all manner of wig-on, in-character antics. Previous sell-out nights at the Book Club in Hoxton have included Acorn Antiques, Whatever Happened to Mommie Dearest, Grey Gardens, and a William Castle double-bill of The Tingler and Straight Jacket. Upcoming events include Cher Day (Sunday 22nd July) Carrie and The Shining (25th July) and Showgirls (29th August). 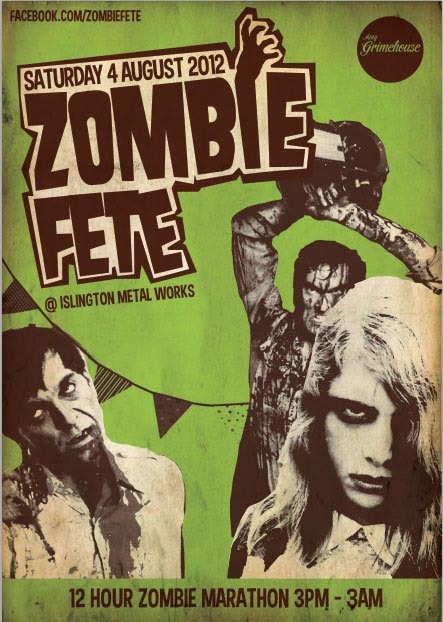 This time Amy Grimehouse are taking it one step further as they present Zombie Fete: a 12-hour homage to all things undead at The Islington Metal Works, London on Saturday 4th August 2012. Dress up is ESSENTIAL and dead royalty promise to be in attendance to cut the ribbon!